Gabby Nafziger attempts to bunt her way on base for Archbold in its win against Tinora Friday. The Blue Streaks shut out the Rams 2-0. 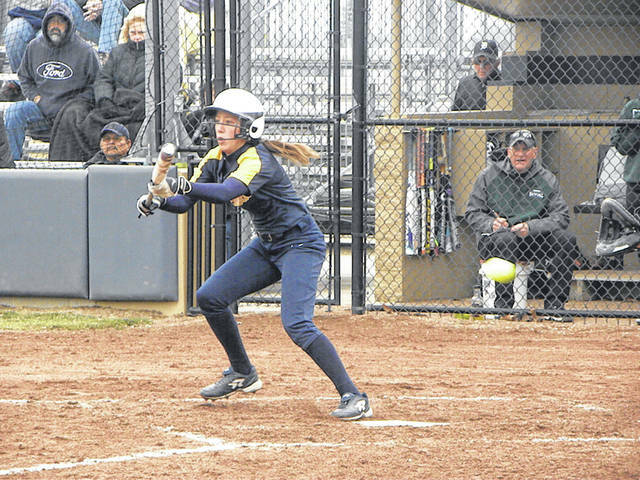 With the offense struggling, Archbold relied on pitching and defense to score a 2-0 non-league softball win over Tinora Friday at Archbold Memorial Park. Single runs in the second and fifth frames were enough for the Blue Streaks. In the second, Madison Roth drew a one-out walk and worked her way around the bases. She stole second, advanced to third on a single by Reagan Kohler and scored when Grace Mayer hit the ball to third, and the Tinora third baseman went for a tag of Kohler coming by and missed. In the fifth, Kylie Sauder legged out a double, took third on a ground out and scored on a passed ball. “Two runs was enough tonight, but that’s not always going to work,” added the Archbold coach. The runs were enough, despite leaving some on the bases. Twice the Streaks loaded the bases with nobody out and could not score. Tinora got out of the first jam by turning a 1-2-3 double play. Chloe Schramm in the circle was more than tough. She scattered five hits, and only needed to get out of one jam. In the bottom of the second (the game was originally scheduled to be played at Tinora) the Rams put runners on second and third with nobody out but a popped up bunt and two strikeouts ended the threat. Schramm walked two and fanned eight in getting the win. The Archbold defense behind Schramm played error-free ball. Sauder had a double and two singles to lead the seven-hit Archbold attack. Gabby Nafziger added a pair of singles. Archbold (4-0) had a doubleheader Saturday against Napoleon get rained out. The Streaks play Monday at Stryker and visits Edgerton Tuesday.